Low back pain is the number one reason that causes people to miss work. Approximately 50 billion dollars is spent on back pain in the U.S. every year. Men and women are equally effected by low back pain. Most low back pain will resolve on its own and exercise can help to prevent it from occurring or reduce the time that it effects someone. If you have low back pain or have had it, seek the advice and treatment from a Physical Therapist and have them teach you a good exercise routine. Backache? You’re not alone. Almost 90% of our country suffers from low back pain at some point. In fact, this is the top reason people miss work. It’s also one of the top reasons people visit healthcare providers. Here’s good news for the pain. Most of the time, low back pathology can be treated with an appropriate exercise routine. The lumbar spine consists of 5 vertebra located at the bottom of the spine and attached to the pelvis and sacrum. The spine is held together with ligaments and joint capsules which are considered static stabilizing structures. It is highly dependent upon the muscle structure that attaches to the vertebra and surrounds them on all sides of the body for dynamic support. There are studies (on cadavers) that indicate that the spine “crumbles” when greater than 18 pounds is applied to the upper segments. With no dynamic stability from the muscles of the spine and core, the spine is very susceptible to injury. Between work and home, too many people live a sedentary lifestyle. At the same time, most people do practice an exercise routine that focuses on the lumbar spine musculature. The lumbar spine is shaped like a reverse “C” when someone has proper posture. Sitting for a prolonged period often times leads to poor lumbar spine posture because most people “slouch”. Muscles that attach from vertebra to vertebra will be overstretched in a “slouched” posture. Any muscle that is overstretched or too shortened will be weak and might not be able to contract forcefully enough to support the spine. Any muscle that is not the focus of a particular exercise might be weakened to a point that it cannot do its job. 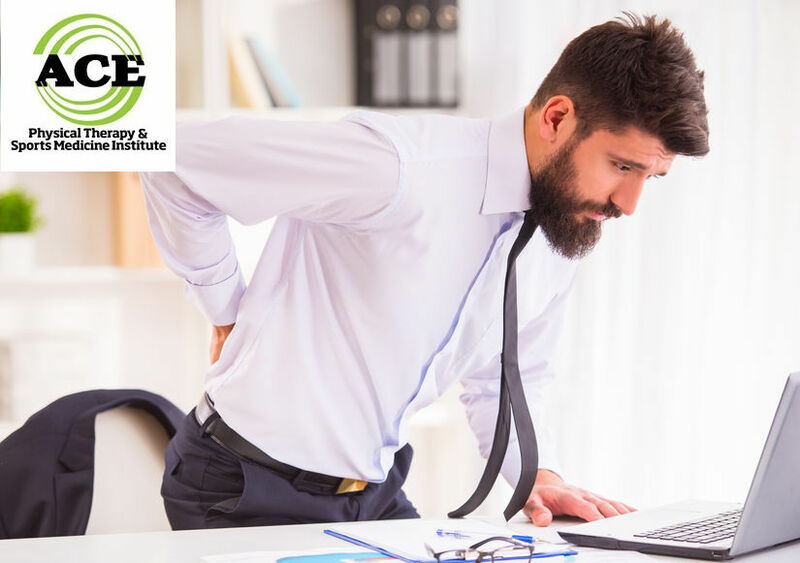 When proper posture is maintained and a few exercises are performed consistently that focus on recruiting the muscles of the lumbar spine and core, most low back conditions resolve without extensive use of drugs or invasive procedures. Physical Therapists are well prepared to educate a patient on an exercise routine that will facilitate and train the muscles that are responsible for stabilizing and moving the lumbar spine in a way that enables it to handle the stresses and strains of everyday life. The following exercises are designed to train the muscles that help to protect and move the spine efficiently. When the spinal musculature is strong and ready to contract, the spine is less susceptible to injury. Bridge: Lie on your back (supine) and bend your knees, so your feet are flat on the floor. Contract your stomach muscles and try to move your belly button towards the floor. Slowly raise your buttocks off of the floor. Pause for 2 seconds at the top and be as still/stable as possible. Side Plank: Lie on one side. Push your body weight up off of the floor and support it with our forearm and elbow on the side where you are lying. The side of your foot rests on the floor during the exercise routine. If this position is too difficult, keep the entire side of your leg below the knee on the floor during the exercise. Hold the position 5-30 seconds or longer. Squat: Stand in front of a chair as if you are going to sit down. Your feet should be shoulder-width apart. Begin to “sit” down slowly and barely touch your buttocks to the chair seat. Return to an erect/standing position. As you lower yourself downward, your chest and head should be held upward as you “stick out” your buttocks. Don’t allow your kneecaps to move too far forward or beyond your toes. Don’t use your hands to assist the motion in either direction unless it is too difficult to perform. All of these exercises can be performed daily or every other day. Planks and Side Planks can be limited to 2-3 of each and the other exercises should be done 15-20 repetitions of each. Low back pain is one of the most common symptoms that healthcare providers treat every day. There are certain exercises that focus on the muscles that move and support the spine and if they are performed consistently they are capable of preventing low back injuries in most instances.